We’re excited to announce the release of our latest feature in Kumulos – App Analytics. With Kumulos Analytics, we give you what we believe to be a world first -The ONLY analytics package that gives you a 360 degree view of how the app is performing. 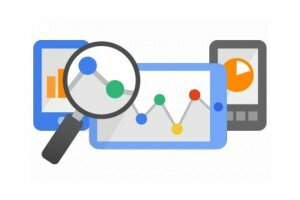 From Google and App store statistics to how the app is getting used – on what devices, where in the world and how often. In the same view you can also track push notification performance also to measure how efforts to engage users are driving up user retention. And the best bit? We present it in an easy to understand, customer friendly format that makes it easy to stay close to your clients and sit down regularly to discuss what you can do to drive greater success from their app. Whats more, Kumulos App Analytics can be easily (and we do mean really easily) fitted to any existing app. So there’s no need for heavy surgery on an existing apps code base just to get a detailed view on how the apps performing. So its used by mobile app developers to re-engage with past mobile app development projects. You don’t even have to be using our award-winning Mobile Backend as a Service feature to use Kumulos App Analytics. We don’t care who you’re using or where you store your data, Kumulos App Analytics will still provide you with the powerful insights you need to make your clients app a success. 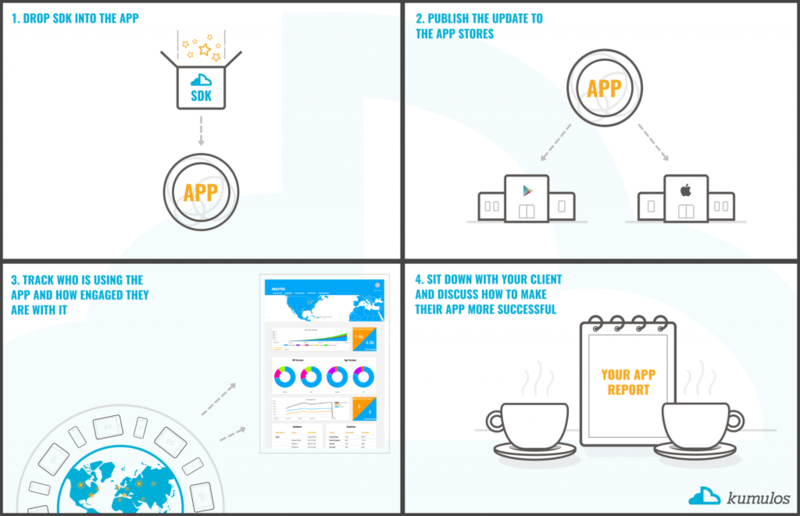 Installation couldn’t be easier – simply enable App Analytics on your dashboard, drop in the Kumulos SDK, update the app in the app store and get ready to enter a world of data. Currently we have SDKs for iOS Swift, iOS Objective C, Android and Cordova with more to come. It also works with Carthage and CocoaPods. Now you can get a detailed analytics view without having to integrate multiple data sources carry the overhead to manage and maintaining home-built analytics dashboards. But we’re not done yet. We also need to tell you about the automated monthly report that comes as part of the package. This summarises up all the important information and automatically creates a PDF report that you send to your customers, with your comments and suggestions edited in if you want. A report that gives you a reason to regularly sit with your clients and plan how to make the app better and better. What Data Is In Kumulos App Analytics? Glad you asked. We’ve put some of the most useful app analytics at your fingertips. An analytics view that helps you answer the most important questions your clients will asking you. How many downloads is my app getting? How many Active users do I have? Are downloads and active users growing? What can I do to get more app store downloads? How often do users use my app? How does user retention compare with different platforms & app versions. What devices do I need to test future app versions on? And we let you drill down into finer detail as you need to. Acquisition – See how many new users your app is acquiring for a given period. If you have App Store optimization enabled, see how well the app is performing in both the Google Play and Apple App Store – comparing search rank on key search terms and app star ratings. Audience – See who is using the app, where in the world they’re located and what device they’re using the app on. If push notifications are enabled, see how many users are subscribed and whether that trend is growing or falling. Engagement – View active users of your app over days (30, 60, 120) or months (6,12). Compare platforms, app versions and device popularity. If Push Notifications are enabled, view how many have been sent and opened. Performance – If you’re using our award winning Kumulos Mobile Backend-as-a-Service (MBaaS) feature to store data, we also let you measure the responsiveness of the app, so you can see whether any changes you have made to the app have positively, or negatively affected response times. And this is just the start! Coming soon we’ll be introducing insights such as Session Tracking – see how long users have opened the app, what time of day, what day of the week and much more. New to app analytics and still not sure what all means? No worries, over in our Insights section, we’ve got plenty of articles to help you out. Take a look at one of our most popular analytics articles, MAU vs. DAU: How to Measure Mobile App Retention and this article on the 14 Mobile App Metrics You Should Be Tracking for Your Clients. So, ready to get started with Kumulos Analytics? If you have any questions, check out our comprehensive docs section, ask a question in our community pages, drop us a line or contact us on Twitter. Not using Kumulos yet? No worries, sign up for a free trial today!